Dicamba drift is affecting millions of acres of farmland. Here's what it is - and what is being done about it. Soy beans plants that have been negatively affected by dicamba. Dicamba is an herbicide that selectively kills broad-leafed weeds (as opposed to plants in the grass family). It is not a new herbicide; it’s been around for decades, though it’s historically been used mostly as a pre-emergent (meaning it was applied to the soil prior to planting to kill weeds). It was just last year that genetically-modified dicamba-resistant seeds – both cotton and soybean – hit the market under the Monsanto brandname Xtend. Those seeds came with a huge caveat, however, in that farmers weren’t legally allowed to spray dicamba on their fields. That’s because dicamba is highly volatile (meaning that it’s easily airborne and susceptible to drift, hence these issues) and it was only in November of 2016 that a (supposedly) less-volatile version was approved for spraying for the 2017 season. Last year, we published a thorough dicamba explainer, which you can read for more. If you’re thinking, “Wait a second, how could Monsanto release a seed that’s resistant to a specific pesticide when that pesticide couldn’t legally be used?” you’re not the only one. Despite warnings not to, farmers began illegally spraying dicamba on Xtend fields (shocking!) last season. And apparently this season’s new, improved – and EPA-approved – dicamba isn’t as drift-resistant as thought. 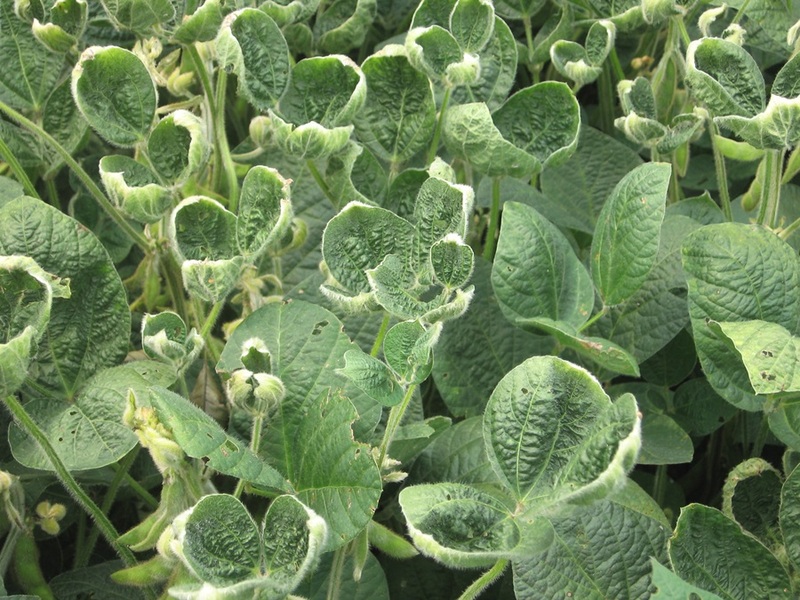 There are still plenty of reports of dicamba making it’s way to fields where it shouldn’t be. If dicamba lands on a field that isn’t planted with Monsanto’s dicamba-resistant crops, the impact can be devastating. Non-resistant soybeans that come into contact with dicamba suffer from puckered leaves, buckled pods, and stunted growth. Farms from Arkansas to North Carolina have been hit; millions of acres have been affected. Monsanto has been sued over this; the lawsuits are ongoing. There’s already been one report of a murder over dicamba spraying. Seriously. What can farmers affected by dicamba drift do? There are reports that federal crop insurance won’t cover damage from dicamba drift, as the crop insurance only covers natural disasters like floods and fire. Theoretically, affected famers could rip out their crops and plant Monsanto’s dicamba-resistant seed, but forcing farmers to lock into the products of a company due to damage inflicted by that company seems pretty ridiculous. What does Monsanto have to say? He repeated Monsanto’s claim that growers are applying the pesticide incorrectly, offering a meandering anecdote about meeting a farmer who had left a residue of another chemical in his spraying applicator which affected the volatility of the dicamba, and another about a farmer who had to use colored smoke bombs to gauge the wind at every given moment. “The beautiful and difficult thing about biology is things happen,” he said. When asked what he recommends for those who have been drifted on and suffered damage, he appeared to either not understand or ignore the question, instead addressing only the customers who have been spraying dicamba. Can’t the government do anything about this? Actually, yes! The Arkansas State Plant Board proposed an emergency ban on dicamba, which was approved by the governor on June 30. And on July 7th, Arkansas and Missouri both issued temporary bans on the use and sale of dicamba. Whether the federal government will get involved is still an open question. When the EPA approved dicamba for crop spraying last November, they predicted that careful application would reduce the risk of drift, but after hundreds of reports, it may be time to revisit that idea. We’ll keep you posted on any updates. The field crops in Southeast Missouri have been cleaner of weeds than they ever were before in the summer of 2018. But hardly anyone in this area had any decent tomatoes. I had to plant tomatoes three times to get any crop and by then it was too late for them to grow and ripen. When I pulled up the damaged plants, the root wad was cone shaped instead of the normal rambling vine root. I blame Dicamba. Do you agree? You are right we had the same problems with several different kinds of produce that didn’t grow right. also the flowering plants will not produce nectar for the bees and butterflies so there go more bees & butterflies. our Renter planted soybeans next to our house. The field was sprayed twice. We are checking into what was sprayed. The reason for checking this out is our cows grazed this field in December and January. We have lost all calves being born fully mature but dead. We are sick and will be looking into this more. PS my tomatoes was about 10% of what it should have been. I have a great respect for the efforts put forth by the EPA concerning the environment. I realize that there is a lot of money and time being spent for the training of the new Dicamba formulations for the 2019 growing season. However, training and proper application help to a great extent. It is my thinking that the REAL problem lies with the volatilization of the Dicamba which can affect many unprotected crops and vegetables.